Designing a mobile app that is trendy is key to standing out, check out these mobile app trends to consider when designing in 2018. Over the past few decades, the Internet has evolved further than anyone ever thought was possible. However, the way we access the Internet has also drastically changed. Long gone are the bulky, slow computers of the 20th century. Today, we have the opportunity to access the Internet at blazing speeds from a handheld device. This is one of the many reasons why companies are taking marketing to mobile devices more seriously this year. And, some businesses’ entire product or service comes in the form of mobile apps. However, it can be difficult to make your app stand out from the thousands of others. So, you need to make sure that your audience finds your app intriguing enough to download or purchase. But, it all starts with knowing what design features are trendy. 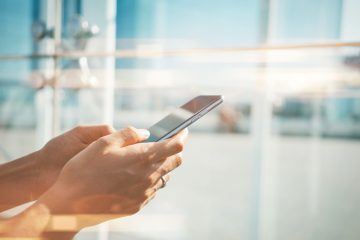 Read on to discover the hottest mobile app trends to look out for in 2018. Smartphones and cameras have progressed to the point where it can be inexpensive to shoot crisp, high-quality video. Thus, there is less of a reason to not include quality video in mobile apps. Let’s take a yoga app, for example. Rather than use diagrams or illustrations to show different poses, video snippets can be an effective alternative that will improve the user’s experience. There are plenty of apps that already incorporate video, but we can expect to see plenty more with time..
Keep in mind, however, that it can be overwhelming for the user to throw a large amount of footage at them, so make sure to keep the videos short. Augmented reality (AR) used to be something that only existed in science fiction novels. This was, of course, until Pokemon Go took the entire world by storm and cemented itself as a groundbreaking mobile app. There’s no doubt that AR is one of the most popular mobile app trends. But, it has uses beyond games and other forms of entertainment. Some apps offer you the capability to use AR to design a mockup of your home. For example, you can decorate an empty room with virtual furniture and other accessories to get a feel of how it would look in real life. One of the most useful apps that incorporates augmented reality is Google Translate, which allows users to use their phones’ camera to translate text they see on signs, documents, etc. As you can expect, AR provides plenty of utility for users and is something to capitalize upon in 2018. We live in an age where we want everything done yesterday, and people are always looking to finish tasks faster. Apps that allow users to navigate via voice commands will prove to be popular in 2018. This feature will be particularly useful for mobile apps that have a large amount of content dispersed over different sections, as it will help users find what they are looking for by analyzing the keywords that they speak. This will make the app far more convenient to use, which is a huge selling point among the consumers of today. Opacity is one of the more subtle mobile app trends of 2018, but a little goes a long way when it comes to design. Menus that have varying levels of transparency can add a lot of depth to an otherwise simple layout. Games, for instance, could have the action continue with lowered visibility behind a pop-up menu to maintain momentum. Every other type of mobile app can use opacity how it sees fit. The utility that opacity provides by adding layers to an app’s interface makes it worth implementing. Animation breathes life into mobile apps. Even something as simple as twinkling stars or glowing letters can vastly improve the experience the user has. It also has a place during transitions and loading screens, too, and can help alleviate the monotony that comes with navigating an app where all the screens look similar to each other. Animation that occurs while scrolling is something to keep in mind, as it makes the application feel alive rather than like a simple document or menu. As previously mentioned, phones and cameras have set the standard for high-quality visuals. But, this bleeds over into graphic design, as well. 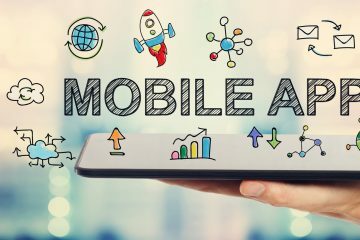 Since consumers will become more and more used to seeing stellar photos and videos, developers should take extra care when designing the visuals of their mobile app. Not only will this serve to entice consumers to download it, it will also make them glad they did. While quality is obviously important, the overall tone is something to keep in mind, as well. Using complementary colors and those that maintain a consistent vibe or mood is necessary when looking to create the best experience for your user. In 2018, crisp visuals will help you stand out. But, they will eventually be the standard for mobile apps, so it’s best to get started now. Haptic feedback is a feature that many app developers either don’t implement or simply forget about. But, it has a place among mobile apps. Haptic feedback is a mobile device vibration mechanic that is used during certain actions. The feeling of vibration in response to touch is something that helps consumers stay engaged with the mobile application. Out of all the mobile app trends that we’ll see in 2018, haptic feedback is something that will become far more common than it used to be. But, developers should always offer consumers the capability to turn it off. Despite it being a tool that helps users stay more engaged, not everyone will want to have it active. 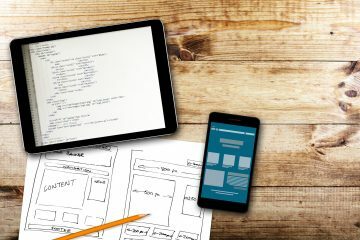 Designing a mobile app can be overwhelming, but having clear goals can help you reach your audience better. In order to give your users the best experience, you’ll need to follow the trends that they are looking for. With this information in mind, you’ll be able to stand out from the crowd in 2018 and have a better shot at resonating with your demographic. To learn about design services that can benefit your company, follow us on Facebook and LinkedIn or contact us.